So, after about three days of temperatures in the seventies, I started feeling like spring was here... or at least close. Then, this morning, I woke up to a blanket of snow on the ground and snow covering my vehicle. AND... we've got snow in the forecast for tomorrow and a couple days during the upcoming week! *sigh* Guess March plans on going out like a lion! Well, I don't have any lion photographs (I might need some Blue Cross Blue Shield insurance if I ran across a lion on one of my walks! 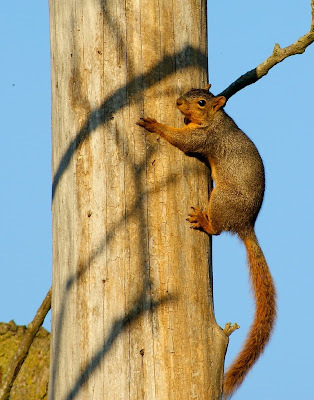 ), so I decided to share a fox squirrel photograph with you this week. I must admit, the snow was VERY pretty this morning. It was a wet snow, so it clung to all the trees, and it looked beautiful. While on my way to work, I ALMOST turned right around and went back home so I could go out and take photos. But, of course, I didn't... like a good girl, I went to work. Hopefully I'll get some pretty photographs tomorrow, if I get the chance. 70's wow!! Great shots. Boom & Gary of the Vermilon River, Canada. Very cute. 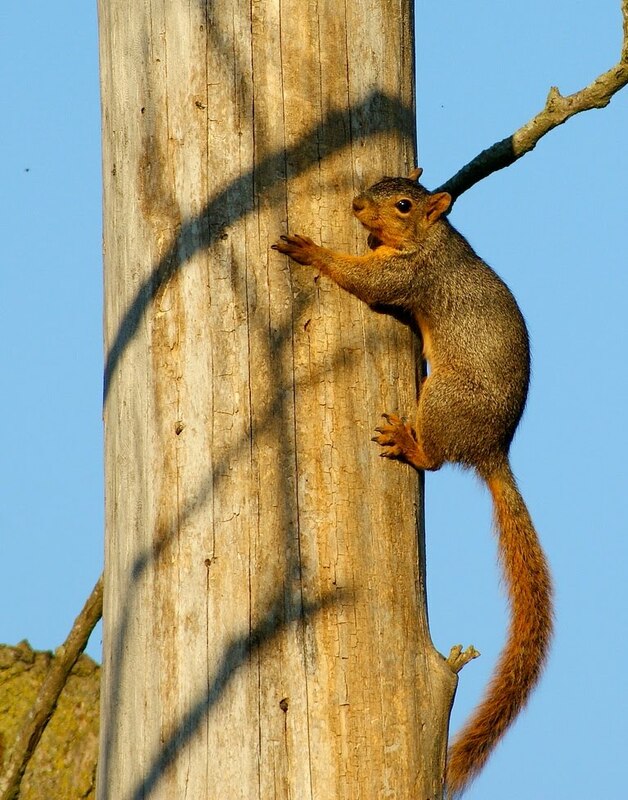 we don't have fox squirrels here and I don't think i even knew they existed. great color. we had the same thing happen. 60 degrees then a snow storm that dumped 7 inches of snow. now we are down in the teens for temperatures. yuck. but it was pretty. How cute,love your tree hugger. What a delightful delightful shot! Love it! And perfect title! What a cute tree hugger! I am thankful for the few nice days we had, and that I was able to get some gardening done. It's 32 degrees right now. It's been snowing most of the day, but has melted on the ground, so there is no accumulation so far. Squirrels, like birds, hide from me when they see my camera. Great shot! Cute squirrel! I love them and hate them--but am glad to share a yard with them when all is said and done. Our March is warm and windy--very very windy. I don't think I'd like a long winter. That's a really cute tree hugger. I caught one too; a chameleon. It will be in another post.